Nintendo recently rolled out its all-in-one plug-and-play gaming console, Super Nintendo Entertainment System (SNES) Classic Edition and it will be bundled with 21 Super Nintendo games like Super Mario Kart, Donkey Kong Country, etc. It is anticipated that the gaming console will hit the stores this fall (September 29) and interested folks will have to shell out $80 to own the console. Rumours are that Nintendo will not continue making the SNES gaming console after 2017. This means you all will have to either pre-order or shell out a huge amount to own one buying from third-party stores when it will be launched. I wouldn’t opt for the latter instead go with the flow and pre-order the SNES Classic Edition and save my extra $$$. Planning to pre-order the SNES Classic Edition and wondering where to hit? Check out the below-listed stores where you can pre-order SNES Classic Edition right now. Amazon is an online store that never disappoints the consumers. 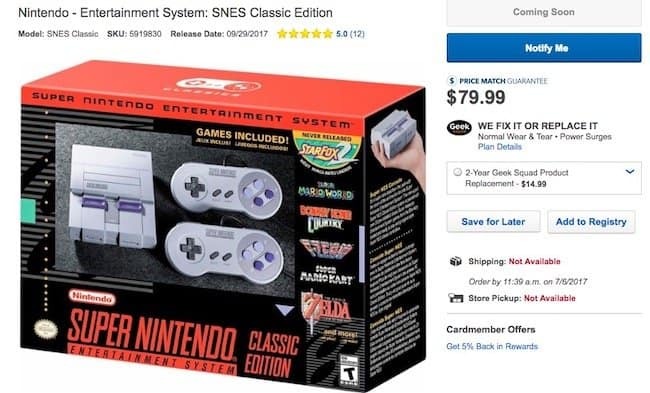 On the North American Amazon website, there is a page dedicated to SNES Classic Edition but now, you can’t pre-order the console. You need to keep yourself updated on the availability of console for pre-orders by clicking on Email Me. Once the console is in the stock, Amazon will notify you by email. The Walmart online store is currently not showing the pre-order button. However, when you check it out, there is a Get-in-stock button which you can hit and as soon as it’s available, you’ll get the notification. 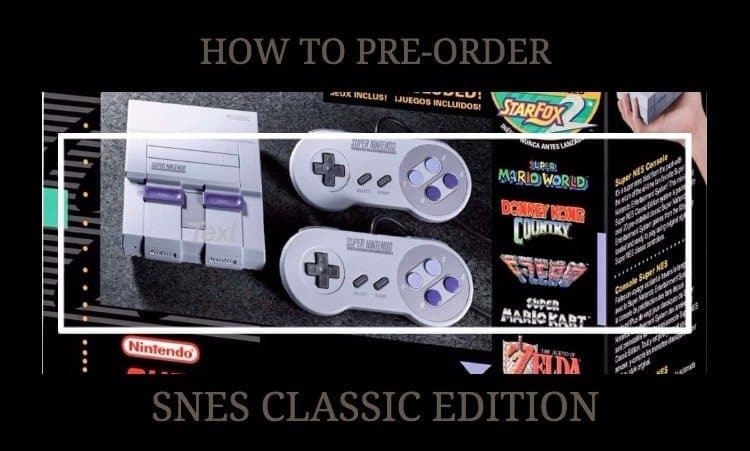 You can then head for pre-order SNES Classic Edition. The date on which it is expected to be on shelves is September 29, 2017, and the store says, ‘more information is on the way’. For now, I would say keep checking out the store for updates on pre-order. Currently, there is no particular page dedicated to the SNES Classic on GameStop. However, the retailer is selling the console. You can give a call to the local store near you and get your name added to the list of people interested in getting further information related to stock. I can’t assure you of the pre-order thing once you get your name registered as GameStop will sell the console on a ‘first come, first served’ basis. So, make sure you have all the updates on the availability. As of now, there is no dedicated page for the Super NES Classic. But then Best Buy is known for keeping hard-to-find stocks in good quantity. You will find a Notify Me button that you can click to get the alerts on how and when you can pre-order SNES Classic Edition. I have written time and again that you have to keep yourself updated if you want to pre-order SNES Classic Edition, either you can bookmark the stores and keep checking your inbox or else what better way than staying tuned up to TheTechBeard. We assure to keep y’all posted about how you can pre-order SNES Classic Edition. Have any viewpoints to share or any question? Feel free to communicate with us whichever way you are comfortable in and if you know where you can pre-order SNES Classic Edition, do let us know in the comments section below.